9th October, 2014 marks the end of the annual-three-month Buddhist Lent in Kuraburi. 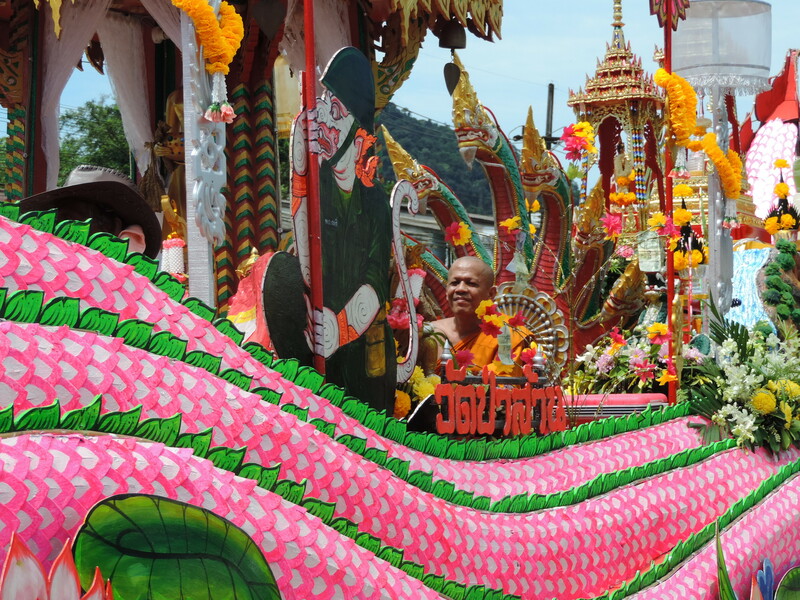 The Chak Phra Festival celebrated in many Southern Thailand provinces is a special annual celebration widely known for its religious devotion and lively atmosphere for this last day. This festival represents the procession of pulling the Buddha images, where this commemorates the Buddha’s return to earth after a rainy season preaching to his mother in heaven. To make this event a success, local communities and temples practiced at least one month in advance to get themselves prepared for this festival. 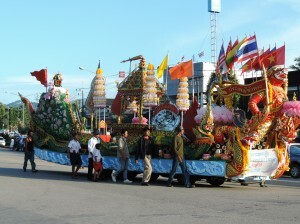 They helped in decorating the trucks in the shapes of animals according to the Buddhist legend. This celebration will take place where these trucks hauled the principal Buddha image that sits on the raft adorned by large nagas. Buddhists believed that the animals represent the vehicle that the Lord Buddha used to return to earth from heaven. Activities such as generous offering of food for the Buddhist monks are also done in the morning. I was really impressed to see many beautifully dressed people joined to dance and sing along to the karaoke truck leading the procession. This festival showed solidarity between the monks of all Buddhist temples and local people in Kuraburi, eventhough they were having a friendly competition against each other of who has the most fun and attractive trucks. Everyone of different age and gender can join in the procession line and enjoy this moment. I was amazed that they had so much lively spirit going on even though they had to walk for several kilometres under the scorching sun. I really enjoyed watching their performance.